Preface. Contents of volumes 1-13. 93. Intermultiplet transitions using neutron spectroscopy (R. Osborn, S.W. Lovesey, A.D. Taylor and E. Balcar). 94. NMR in intermetallic compounds (E. Dormann). 95. Light scattering in intermetallic compounds (E. Zirngiebl and G. Güntherodt). 96. The electron-phonon interaction in intermetallic compounds (P. Thalmeier and B. Lüthi). 97. Heavy fermions (N. Grewe and F. Steglich). Subject index. 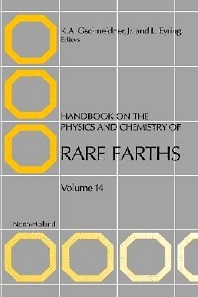 This volume differs somewhat from the previous volumes in the series in that there is a strong emphasis on the physical aspects and not so much on the chemical aspects of intermetallic compounds. Two of the chapters are concerned with relatively new experimental methods of studying rare earth metallic phases - high energy neutron spectroscopy and light scattering. In these chapters the authors explain the new kinds of information one obtains from these techniques and how this complements the knowledge previously gleaned from the more common measurements - such as NMR, heat capacities, magnetic susceptibility, transport and elastic properties. One of the remaining three chapters deals with NMR studies of rare earth intermetallics and the final two chapters are concerned, not so much with a particular experimental technique, but with physical phenomena that occur in these compounds: the electron-phonon interaction and heavy fermion behavior.